One recliner is nice, but why not share the love with a two-seat recliner? Stop future arguments for the best seat in the house with a reclining loveseat and its two, blissful reclining seats with full, chaise-cushion support. Also boasts plush support for arms and back plus a center console with storage and two cupholders. 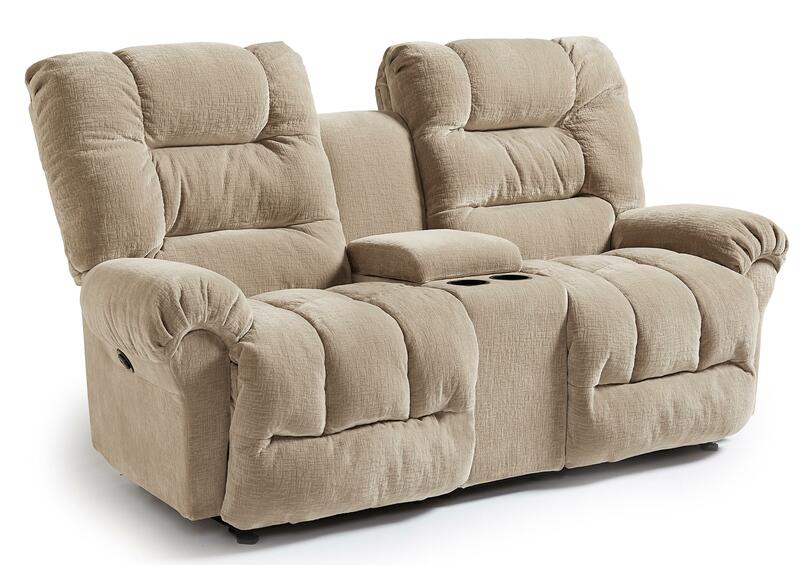 The Seger Casual Rocking Reclining Loveseat with Cupholder Console by Best Home Furnishings at Ryan Furniture in the Havre De Grace, Maryland, Aberdeen, Bel Air North, Churchville area. Product availability may vary. Contact us for the most current availability on this product. With a design based off our best-selling recliner, the relaxed and cozy feel of this collection is perfect for entertaining guests or just ordinary, everyday lounging. This collection is pillow-plush from top to toe with the sink-in seating we're famous for. The reclining sofa and loveseats all feature full-support chaise legrests and the option of power recline for the ultimate comfort treat. The Seger collection is a great option if you are looking for Casual furniture in the Havre De Grace, Maryland, Aberdeen, Bel Air North, Churchville area. Browse other items in the Seger collection from Ryan Furniture in the Havre De Grace, Maryland, Aberdeen, Bel Air North, Churchville area.